Belfast, New Year’s Day 1972. Forty five years ago. There hadn’t been a rock concert played in Belfast for six months. Bands had stopped playing dates in Belfast. In July 1971 3,000 troops imposed a curfew on the nationalist Lower Falls area of Belfast, firing more than 1,500 rounds of ammunition in gun battles with the IRA and killing four people. Bloody Sunday, when the British army shot dead thirteen civilians, was less than a month away. 1972 would be the height of the troubles. And on the first day of that momentous year Irishman Rory Gallagher, born in Ballyshannon, was due to play a New Year’s Day concert in front of 2,000 people. Imagine that. The first public music event for over six months in a city of 300,000. You might not blame touring musicians for not wanting to come over and play. The night before – New Year’s Eve 1970 – had seen Belfast’s biggest ever bomb blast, one of ten explosions that night. At 11.50pm Gallagher had been tuning his guitar at Belfast University ball, ready to play a set for the students, when a huge explosion rattled the windows from half a mile away. Gallagher just grinned, and carried on regardless, but it couldn’t have been a great feeling to know outside the building was mayhem. Then came the New Year’s Day gig at the famous Ulster Hall. Word had come that the IRA would “leave it alone”, but you could never be entirely certain. It sounds amazing. We can only imagine how the people of Belfast must have felt when a guitarist of Rory Gallagher’s stature came to play for them at such a difficult time. They had not been forgotten. Gallagher was an incredible guitarist, as evidenced by albums such as “Deuce”, “Against The Grain” and “Tattoo”. But most of all, when playing live he had raw, fresh spontaneity, and you can hear a bit of that mesmerising style in his “Irish Tour ’74” album. It was no coincidence that The Rolling Stones wanted him to replace Mick Taylor, that his first band, Taste, supported Cream at their Royal Albert Hall farewell concerts or that Gallagher himself played with Muddy Waters on the latter’s “London Sessions” album. My reason for telling this tale is twofold. Firstly, it has been 45 years, and it seems a good time to mark the occasion and talk about a proper blues legend. Second, there’s a new Rory Gallagher tribute album coming out next week, recorded by American blues guitarist and Every Record Tells A Story favourite Michael Katon. In the next post, I’ll be interviewing Michael, and finding out how the album came about, whilst delving a little into the life of a bluesman who comes from the town of Hell, Michigan. 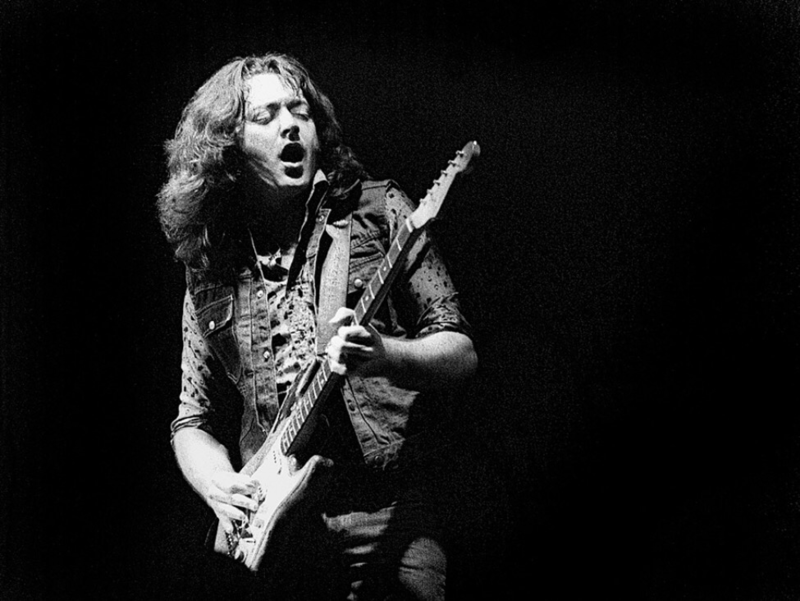 In the meantime, here’s a playlist of some Rory Gallagher tracks for your enjoyment…. Great guitarist was Rory and very noble of Hendrix for his acknowledgement of him. i remember the summer of 72 at home in northern ireland..rory’s album ‘live in europe’ was in everybody’s collection along with the ziggy’s and harvests, without any of the oxygen of a hit single. Excellent post. Was actually discussing Rory Gallacher elsewhere just the other day – his Irish Tour ’74 album being the subject of that particular conversation (can’t think of many live albums better than that). I really enjoyed this post. I have never listened to much by Rory in the past, but that is about to change. Thanks for sharing.